Franciszka Arnsztajnowa ([fraɲˈt͡ɕiʂka arnʂtajˈnɔva]; in full: Franciszka Hanna Arnsztajnowa; 19 February 1865 – August 1942) was a Polish poet, playwright, and translator of Jewish descent. Much of her creative oeuvre falls within the Young Poland period, stylistically encompassing the twilight of neo-romanticism. She is called "the legend of Lublin". Franciszka Arnsztajnowa was the daughter of the Lublin-based novelist Malwina Meyerson (real name, Małka Meyerson, née Horowicz (Horowitz); 1839–1921), a Lublin native, and Bernard (Berek, or Ber) Meyerson (b. 1837), a native of Tykocin, an international trader and a major Lublin financier. Her brother was the French philosopher, Émile Meyerson, based in Paris. She attended high school for girls in Lublin, and went to Germany for higher studies in biology, travelling extensively in Europe. On 7 January 1885 she married Marek Arnsztein (alternative spellings: Arnsztejn, Arnsztajn, Arnstein; 1855–1930), a physician educated in Warsaw, Vienna, Berlin, and Paris, and a political and social activist, a native of Kazimierz Dolny based in Lublin from 1884. They had a daughter, Stefanja Arnsztajnówna (c.1890–1942; married name Mieczysławska), and a son, Jan Arnsztajn (1897–1934), much beloved of Arnsztajnowa and whose death from tuberculosis left her devastated. As a poet Arnsztajnowa debuted at the age of 23 with the poem "Na okręcie" (On Board a Ship) published in the newspaper Kuryer Codzienny of 1 October 1888. She issued her first collection of poetry in book form in 1895 under the title Poezye, a volume which she dedicated to her mother, the novelist Malwina Meyerson. The book is divided into six distinct sections under such headings as "Sonety" (Sonnets), "Melodye" (Melodies), "Historye" (Histories), and "Z gór Tyrolu" (From the Mountains of Tyrol). The opening poem, untitled but beginning with the words "O nie płacz..." (Weep thou not...; p. 7), sets the tone for the entire collection as she tries, with uncommon tenderness and filial piety, to soothe her mother's pain at having her own songs dispersed by the winds of time to the farthermost recesses of the soul: the implication is that the poems in this collection will become her mother's own, which the daughter will now sing for her, the lute in hand, sitting at her feet. (In the very last poem of the collection the poet again addresses her mother directly, "O mother, why give me a heart so | Tender...") The chief characteristic of the collection, thematically speaking, was however the preoccupation and love she evinced for the people living close to the land, their ordinary lives and folkloric customs. At the same time she delicately touched upon the social questions of the day employing language in the balladic-melancholic key. The volume will instantly establish Arnsztajnowa as a major voice in Polish poetry among those exploring the nation's folk themes. I o błogosławionej dolinie zamarzę. And slip down the blessed valley into reverie. Wacław Gralewski (1900–1972), a poet and prominent Lublin littérateur, cites a report (which he qualifies as uncorroborated) that Arnsztajnowa was supposed to undergo a (successful) therapy for tuberculosis at Merano, an option open only to the very rich. Wiemy, że Jutro to za Dziś zapłata. Oto Dziś w imię Jutra na nas woła. Czas wzrok od grobów odwrócić pokuty! Kielnią i mieczem stawiać węgły domu. During the First World War Arnsztajnowa (nom de guerre Ara) participated in armed struggle for the independence of Poland as a member of the secret Polish Military Organisation in Lublin (her town house in the Old Town of Lublin served as a secret archive of the POW and a hub for other organizations, such as the Union of Armed Struggle and the clandestine Polish boy scout movement; the expansive basement served as an arsenal). Some of the patriotic feelings and motivations that actuated her participation in the freedom struggle will later find an echo in her collection of poetry entitled Archanioł jutra ("The Archangel of the Morrow"), comprising verses written during the war, which she will publish in 1924 dedicating it to the alumni of the Lublin schools who had fallen in that struggle. With two compositions included in the volume Arnsztajnowa paid tribute to the luminaries of Polish literature, Marja Konopnicka and Bolesław Prus, both recently deceased then. However, it is to Stefan Żeromski (after his death in 1925) that Arnsztajnowa will in the latter part of her life acknowledge her indebtedness for the general character of her oeuvre and the direction she followed in creating it. Archanioł jutra contains verses of great strength and incisiveness, unparalleled in her prior work, the composition "O Dniu Jutrzejszy" (O, Thou Day of the Morrow! ), written in 1914, belonging to the most beautiful among them in the opinion of the historian of literature, Feliks Araszkiewicz. The poem speaks of the brethren's (comrades-in-arms') blood shed in the struggle, whose rising vapours conceal the mystery of tomorrow (the day is personified in the poem, addressed as "you", and conceived of as a day of reckoning, indeed, as a metonymy for retributive justice itself): the mystery of tomorrow will be revealed once we tear down your deadly veil to look you directly in the face, without the sort of fear that makes the victim bow his head before the executioner: for tomorrow we know full well will be the day of payback for today. (The poem, heavily dependent on stylized linguistics and medieval vocabulary (e.g., gzło, line 3, a medieval term for a kind of female garment, here used figuratively in the sense of "veil"), does not lend itself easily to verse translation but is reproduced in the original to the left.) Thus the archangel of the title of the entire collection, Archanioł jutra (“The Archangel of the Morrow”), can easily be construed as the avenging angel. Another composition belonging to this period is the poem entitled "Powrót" (The Return) published in a literary journal in April 1916. Comprising five ottava rima stanzas, the 40-line poem brought her the Silver Laurel of the Polish Academy of Literature, a (now historical) body awarding the most prestigious literary honours of the land at the time. During the Interbellum Arnsztajnowa collaborated with the newspapers and literary magazines Dziennik Lubelski, Kamena, and Kurjer Lubelski; she was the editor-in-chief of the literary supplement Dodatek Literacki to the newspaper Ziemia Lubelska. At the same time she was the moving spirit of the literary life of the city of Lublin, a fact recognized by outside observers, co-founding in 1932, together with the poet Józef Czechowicz, the Lublin section of the writers' union, the Związek Literatów (see Polish Writers' Union), of which she served as the president. To this period, in addition to the aforementioned collection Archanioł jutra (1924), belong also her volumes of poetry entitled Odloty ("Flying Away"; 1932), a compilation of verses published in literary journals between 1902 and 1926, and the collection produced jointly with Józef Czechowicz, Stare kamienie ("Old Stones"; 1934) which was at once a tribute to her beloved Lublin, a city in which she continued to reside until 1934, epitomized in the poem "Tobie śpiewam, Lublinie" (To You do I Sing, O Lublin! ), and a form of a literary farewell. Contemporary critics observed that the unspecified nature of the collaboration between the two famous poets gave the publication an anonymous tinge, and although subsequent scholarship clearly differentiated between the pieces written by Arnsztajnowa and those written by Czechowicz mistakes of attribution did occur in succeeding years and decades. Odloty represents a continuation of the modernist esthetics that dominated the first phase of Arnsztajnowa's literary life, as evidenced in the imagery employed and in the method of shaping of the lyrical persona, as well as in the return of the fairy-tale motifs favoured by the Young Poland poets, such as lakes, mirrors, and shadows. Although on occasion she adopts a new cadence closer to the spirit of the Skamander circle then gaining an ascendancy over Polish poetics, such diversions are rare. The title poem, "Odloty" (Flying Away), first printed in a literary magazine in 1905, is a mystical allegory on the inevitability of the departure, of parting despite the ties thereby shattered. Arnsztajnowa was co-founder of the historically important Kraków periodical Życie famously associated with the artistic avant-garde and with the person of Stanisław Przybyszewski, for which she wrote a programmatic poem, and had close ties to the literary magazine Kamena (see Kamena), founded and edited by K. A. Jaworski: the journal began publication in 1933 with a poem by Arnsztajnowa, "Na Olejnej" (In Olejna Street), on the first page of the first issue. Right-wing critics (such as Juljan Babiński, 1900–1943) accused Arnsztajnowa of left-wing bias against the szlachta, in favour of the common people. Arnsztajnowa's innumerable writings in prose, strewn across innumerable journals and magazines, frequently published under pseudonyms that even Arnsztajnowa could not keep track of during her lifetime, present an impossible task for a compiler wishing to present a reasonably comprehensive picture of her bibliography — as observed by the historian of literature and her contemporary, Feliks Araszkiewicz (1895–1966). Among the pen-names she is known to have used are J. Górecka, and Stefan Orlik. Arnsztajnowa's dramatic works remain largely confined to manuscript, including her award-winning play Na wyżynach (Krystyna) ("On the Heights: Christina") which was staged to great acclaim in Lvov in 1899. Her other plays which were seen on the stages of Kraków and Łódź, in addition to those of Lublin and Lvov, but which remain unpublished, are (with dates of theatre production) Na kuracji ("A Stay at a Spa"; 1894), Perkun ("Perkūnas"; 1896), and W stojącej wodzie ("In the Stagnant Water"; 1901). Only two one-act plays have been published (in literary journals), Widmo: Ballada w I akcie ("The Spectre: A Ballad in One Act"; published in Ateneum in 1905, a dialogue between two characters identified only as male and female), and Luxoniolo (published in the Kurjer Lubelski in 1911). The play Córka ("The Daughter") has never been staged or published. Arnsztajnowa participated in the women's suffrage movement, supporting with readings from her poems the meetings and events of organizations involved in the movement, including the Związek Równouprawnienia Kobiet Polskich (Union for the Equal Rights of Polish Women) founded in 1907 by Paulina Kuczalska-Reinschmit (1859–1921). In 1912 Arnsztajnowa participated in a feminist exhibition mounted by Polish women writers in Prague. Always respectful of and ready to honour others for their achievement in their field, in 1899 Arnsztajnowa contributed to the liber amicorum for Aleksander Świętochowski on the occasion of the 25th anniversary of his editorial work, a sumptuously produced volume that opens with her poem "Grajek" (The Fiddler; from the Poezye of 1895). Some of her tributes in verse, even when marked by a high level of artistic accomplishment, were entirely private, meant solely for the honouree. Her poem composed in tribute to the Polish geographer, Wacław Nałkowski (1851–1911), the father of the writer Zofja Nałkowska, on the occasion of the 25th anniversary of his scholarly work in January 1903, did not come to light until 55 years later, for example. Her patriotic feelings found expression in the contribution she made to the collective volume published by the Teachers' Union to commemorate the school strikes in Partitioned Poland mounted in protest against marginalization of Polish culture by the occupying powers; while in 1935 Arnsztajnowa served on the editorial board of a commemorative volume for the Polish Military Organisation, to which she contributed the keynote poem (on the theme of the Unknown Soldier) serving as a motto for the publication. Arnsztajnowa's patriotic fervour carried her so far as to contribute three technically accomplished, genuinely high-calibre poems — "Jego Imię" (His Name), "O, Wodzu!" (O Leader! ), and "Wodzowi-twórcy" (To the Leader-Creator) — to the collection of panegyrics in honour of Józef Piłsudski published in 1924, two years before his coup d'état of May 1926. Among the 33 contributors to the collection (some of them not established poets), only the names of Józef Czechowicz, Jan Lechoń and Kazimierz Tetmajer stand in the same rank with Arnsztajnowa's. After the coup d'état of May 1926, during a visit to Lublin in June 1931 of Piłsudski's figurehead president, Ignacy Mościcki, she wrote in poetic prose a fulsome welcome for him in a local newspaper ("whole streets are running out to Him with open arms while ancient city walls silvered by age reverberate with the Good News: hail Thou the visible manifestation of the Independence! ", etc.). In 1910 and 1911 Arnsztajnowa was the object of a book boycott motivated by antisemitic sentiment and spearheaded by the Endecja circles. In the summer of 1937 Arnsztajnowa, then a 72-year-old grande dame of Polish literature (a recipient of the Silver Laurel of the Polish Academy of Literature and a decorated veteran of the Polish war of independence), was the victim of antisemitic attacks from the Endecja literary circles connected with the literary magazine Prosto z mostu of Warsaw, a publication billing itself in the masthead as an artistic-literary weekly, edited and published by Stanisław Piasecki (1900–1941). In its edition of 25 July 1937 the magazine in question carried a quasi-anonymous racist and in parts scurrilously versified polemic signed only "(st. p.)" (which would have been universally understood by readers to refer to Piasecki) in which Arnsztajnowa was called, sarcastically, the "erector of the edifice of the Polish language" (sc., one of the primary forces shaping the mother tongue) without being Polish. Although other Polish writers of Jewish descent were held up to ridicule by name as well, Arnsztajnowa was selected for special treatment. "Consider this efflorescence of Polish speech from under the aegis of Arnsztajnowa", jeered the writer of the article, presenting his readers with a sentence taken out of context from one of Arnsztajnowa's articles (on the complex subject of the phenomenology of contemporary French culture), which was supposed to offend against linguistic norm (it had, in fact, a typographical error involving the omission of a single letter). The attack on Arnsztajnowa continued under the guise of an attack on Ludwik Fryde (1912–1942), despite his young age already a distinguished literary critic of Jewish descent, whose surname was altered to "frydek" so that it might rhyme with żydek ("the little jew", the lower-case initials employed for their added insulting value) while the author went on: "so it is among us that every common-or-garden pederast, if he has talent, he bandies it about", etc. The incident generated a groundswell of support for her from the Polish reading public, including an open letter signed by many writers and poets, some of whom also published individual expressions of support — as did, for example, Józef Łobodowski, calling the attack "outrageous and revolting". After Łobodowski's protest published in the most prestigious literary journal of the interbellum epoch, the Wiadomości Literackie, Piasecki remained unrepentant, and a fresh antisemitic attack on Arnsztajnowa was printed with additional vitriol in the Prosto z mostu edition of 8 August 1937. The antisemitic and homophobic attack on Arnsztajnowa and others was originally authored by Jerzy Pietrkiewicz and published in the ultra-nationalist and antisemitic periodical Myśl Narodowa ("National Thought"), but Prosto z mostu went beyond the text of the original racist pasquinade in its attempt to disseminate, defend and justify it. For its part Myśl Narodowa will continue its attack on Arnsztajnowa on other fronts, bemoaning (in its issue of 29 August 1937) "the pernicious Jewish dispensation (gospodarka żydów) in the field of literature" for which the evidence was to be the supposed falsification by Niemirowska and Arnsztajnowa of Kipling (through their alleged toning down or expurgation of antisemitic passages in the works of this author). Published sources differ on the circumstances of her death, but there is a consensus that she did not die in Lublin, all the sources citing the Warsaw Ghetto — a place where she had gone proudly and of her own accord, "to be with everybody" — as either the place of her death or the place of her deportation immediately before her death. In some accounts she would have died in the Warsaw Ghetto of an infectious disease (typhus); according to other accounts she would have been violently murdered there by the Nazis, or have taken poison out of despair after seeing her daughter, Stefanja (who in all accounts accompanied her in the Warsaw Ghetto), shot dead by the Nazis. In some sources she would have been murdered after having been deported from the Warsaw Ghetto to the Treblinka extermination camp (the most common narrative, but not invested with greater evidentiary credibility than the other versions). Most authorities agree that she died in 1942, at the age of 77, however one otherwise well informed writer cites 1943 as the year of her death. In what is perhaps the most reliable eyewitness report, that of the poet Hanna Mortkowicz-Olczakowa (1905–1968), at the moment of her death — during the mass murder of patients at a hospital near All Saints' Church in Warsaw where she lay ill — Arnsztajnowa had two books with her, Dante's Divine Comedy and her own collection of poetry published in 1932, Odloty ("Flying Away"), on the poetics of departure. Franciszka Arnsztajnowa was decorated by the government of the Second Polish Republic with the Cross of Valour (Krzyż Walecznych), the Cross of Independence (Krzyż Niepodległości), as well as the Knight's Cross (Krzyż Kawalerski) of the Order of Polonia Restituta, one of the country's highest honours. She was the recipient of the Silver Laurel of the Polish Academy of Literature in 1936. She has a street named after herself in Lublin, the ulica Franciszki Arnsztajnowej. Feliks Araszkiewicz, Refleksy literackie: studja, szkice, notatki, Lublin, [Towarzystwo Przyjaciół Nauk w Lublinie], 1934, pages 113–121. Ewa Łoś, Franciszka Arnsztajnowa, 1865–1942, Lublin, Muzeum Lubelskie, Oddział im. Józefa Czechowicza, 1988. Michał Domański, entry s.v. "Arnsztajnowa", in: Słownik biograficzny miasta Lublina, vol. 1, ed. T. Radzik, et al., Lublin, Wydawnictwo Uniwersytetu Marii Curie-Skłodowskiej, 1993, pages 15ff. ISBN 8322705646. Wikimedia Commons has media related to Franciszka Arnsztajnowa. ^ Ludwik Czarkowski, Pseudonimy i kryptonimy polskie, Wilno, Księgarnia Stowarzyszenia Nauczycielstwa Polskiego, 1922, p. 29. ^ Słownik pseudonimów i kryptonimów pisarzy polskich oraz Polski dotyczących, vol. 1 (Pseudonimy i kryptonimy od A–K), ed. A. Bar, et al., Kraków, Krakowskie Koło Związku Bibliotekarzy Polskich, 1936, p. 134. Arnsztajnowa's first name is here mistakenly identified as "Felicja" and her surname misspelled as "Armsteinowa" (sic). ^ Ludwik Czarkowski, Pseudonimy i kryptonimy polskie, Wilno, Księgarnia Stowarzyszenia Nauczycielstwa Polskiego, 1922, p. 31. ^ Słownik pseudonimów i kryptonimów pisarzy polskich oraz Polski dotyczących, vol. 2 (Pseudonimy i kryptonimy od L–Ż), ed. A. Bar, et al., Kraków, Krakowskie Koło Związku Bibliotekarzy Polskich, 1936, p. 72. Arnsztajnowa's first name is here mistakenly identified as "Felicja" and her surname misspelled as "Armstajnowa" (sic). ^ a b "Lista odznaczonych złotym i serbrnym 'wawrzynem akademickim'" (List of the Recipients of the Golden and Silver Laurels of the Academy [of Literature]), Ilustrowany Kuryer Codzienny (Kraków), vol. 27, No. 313, 10 November 1936, p. 4. ^ a b Cf. The oral recollections of Janina Arnsztajn-Titkow, Franciszka Arnsztajnowa's granddaughter, recorded by A. Zińczuk on 26 March 2010 for the Ośrodek Brama Grodzka/Teatr NN of Lublin. See transcript online. ^ a b So Słownik biograficzny miasta Lublina (see Bibliography). ^ a b Aleksander B. Skotnicki, et al., Jewish Society in Poland: Customs and Participation in the Fight for Independence: Many Faces of Cracovian Jewry, tr. J. Niedbal & K. Baran, Kraków, Wydawnictwo, 2009, p. 109. ISBN 9788361060765, ISBN 8361060766. ^ F. Arnsztajnowa, [untitled poem]; in id., Poezye, Warsaw, Gebethner i Wolff, 1895, p. 88. ^ a b Feliks Araszkiewicz (see Bibliography), p. 115. ^ Cf. Stanisław Zdziarski, Pierwiastek ludowy w poezji polskiej XIX wieku: studja porównawczo-literackie, Warsaw, E. Wende, 1901. ^ F. Arnsztajnowa, Poezye: serya druga, Kraków, G. Gebethner i Spółka, 1899. ^ F. Arnsztajnowa, “Wspomnienie Meranu” (A Remembrance of Merano; lines 1–3); in id., Poezye: serya druga, 2nd ed., Warsaw, Gebethner i Wolff, 1911, p. 90. ^ Wacław Gralewski, Stalowa tęcza: wspomnienia o Józefie Czechowiczu, Warsaw, Państwowy Instytut Wydawniczy, 1968, p. 60. ^ F. Arnsztajnowa, "O Dniu Jutrzejszy" (O, Thou Day of the Morrow! ); in id., Archanioł jutra, Lublin, Spółdzielnia Wydawawnicza Placówka Lubelska, 1924, p. 13. Exceptionally, in contravention of Polish typographic conventions, all words of the poem's title are capitalized in the original to indicate pathos. ^ Feliks Araszkiewicz (see Bibliography), p. 119. ^ So Feliks Araszkiewicz (see Bibliography), p. 117. ^ F. Arnsztajnowa, "Powrót", Sprawa Polska (Lublin), No. 13, 18 April 1916, p. 11. ^ Cf. Jan Szczawiej, "Życie literackie w Lubelszczyźnie", Ilustrowany Kuryer Codzienny (Kraków), vol. 25, No. 28, 28 January 1934, p. 3. 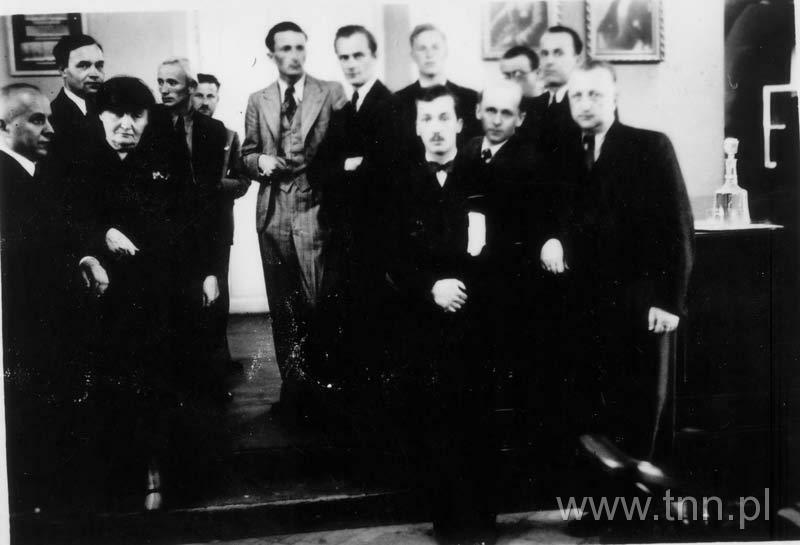 ^ F. Arnsztajnowa, Odloty, Lublin, Związek Literatów w Lublinie, 1932. ^ Franciszka Arnsztajnowa & Józef Czechowicz, Stare kamienie: [poezye], Lublin, [n.p. ], 1934. ^ K. W. Zawodziński, "Liryka" (Lyric Poetry); in Rocznik Literacki za rok 1934, ed. Z. Szmydtowa, Warsaw, Instytut Literacki, 1935, p. 53. ^ a b Tadeusz Kłak, Miasto poetów: poezja lubelska, 1918–1939, Tarnów, The Author; Lublin, Wojewódzki Dom Kultury, 2001. ISBN 8391501825. ^ F. Arnsztajnowa, "Odloty", Ateneum (Warsaw), vol. 3, No. 9, September 1905, p. 165. ^ Franciszka Arnsztajnowa, "Na Olejnej (z cyklu Stare kamienie)" (In Olejna Street — from the Stare kamienie Cycle), Kamena (Chełm Lubelski), vol. 1, No. 1, September 1933, p. 1. See online. ^ Juljan Babiński, "Na marginesie", Tęcza: ilustrowany miesięcznik (Poznań), vol. 11, No. 5, May 1937, p. 85. ^ Feliks Araszkiewicz (see Bibliography), p. 114. ^ F. Arnsztajnowa, "Widmo: Ballada w I akcie", Ateneum (Warsaw), Year III, vol. 1, Nos. 1–3, January–March 1905, pp. 104–109. ^ Julian Krzyżanowski, Neoromantyzm polski, 1890–1918, 3rd ed., ed. T. Brzozowska-Komorowska & M. Bokszczanin, Wrocław, Zakład Narodowy im. Ossolińskich, 1980, p. 347. ISBN 8304003902. ^ Památník výstavy práce ženy polské v Praze 1912, comp., ed. & tr. Pavla Maternová, Prague, Ústřední spolek českých žen, 1912. Cf. Helena Rzepecka, "Zbiorowy głos doraźny" (The Collective Voice of the Moment), Literatura i Sztuka (Poznań), vol. 4, No. 36, 8 September 1912, pp. 563–567. ^ Feliks Araszkiewicz (see Bibliography), p. 118. ^ Rudyard Kipling, "Grody i Trony w obliczu czasu..." (Cities and Thrones and Powers), tr. Franciszka Arnsztajnowa, Kamena (Chełm Lubelski), vol. 1, No. 4, December 1933, p. 68. Rudyard Kipling, "Pieśń harfiarska duńskich niewiast" (Harp Song of the Dane Women), tr. Franciszka Arnsztajnowa, Kamena, vol. 2, No. 7 (17), March 1935, p. 134. ^ Jean Moréas, "Przekłady z poezyj J. Moréasa" (Translations of J. Moréas's Verses), Kurjer Lubelski (Lublin), vol. 10, No. 4, 4 January 1932, p. 2. Includes two poems from Les Stances by Moréas in Arnsztajnowa's translation: Book 2, VII; and Book 3, XII. The latter poem reprinted in Jean Moréas, "Ze Stanc * * *" (From Les Stances * * *), tr. Franciszka Arnsztajnowa, Kamena (Chełm Lubelski), vol. 3, No. 4 (24), December 1935, p. 73. ^ Franciszka Arnsztajnowa, "Grajek" (The Fiddler); in: "Prawda": książka zbiorowa dla uczczenia dwudziestopięcioletniej działalności Aleksandra Świętochowskiego, 1870–1895, Lvov, Księgarnia H. Altenberga [etc. ], 1899, pp. 1–8. ^ Roman Rosiak, "Franciszka Arnsztajnowa w hołdzie Wacławowi Nałkowskiemu" (Arnsztajnowa's Tribute to Wacław Nałkowski), Kamena (Lublin), vol. 25, No. 19 (161), 15 October 1958, p. 3. ^ Walka o szkołę polską: w 25-lecie strajku szkolnego, ed. S. Drzewiecki, et al., Warsaw, [n.p. ; but under the imprint of the Związki Nauczycielstwa Polskich Szkół Powszechnych i Średnich], 1930, p. 294. ^ Franciszka Arnsztajnowa, [untitled poem]; in Pod sztandarem P.O.W. : szkice i wspomnienia zebrane dla uczczenia uroczystości poświęcenia sztandaru, odsłonięcia tablicy pamiątkowej ś.p. płk. Mieczysława Więckowskiego i połączenia okręgu siedleckiego Związku Peowiaków z okręgiem lubelskim: Lublin w marcu 1935 roku, ed. F. Arnsztajnowa, et al., Lublin, Zarząd Okręgu i Koło Związku Peowiaków, 1935, p. 5. ^ Franciszka Arnsztejnowa [sic, not "Arnsztajnowa"], "Jego Imię" (His Name); in Józef Piłsudski w poezji: antologja, Lublin, Dom Wydawniczy Franciszek Głowiński i S-ka, 1924, pp. 3–4. Id., "O, Wodzu!" (O Leader! ), in: ibid., p. 5. Id., "Wodzowi-twórcy" (To the Leader-Creator), in: ibid., p. 6. ^ F. Arnsztajnowa, "Dostojnemu Gościowi na powitanie" (Welcoming the Distinguished Guest), Ziemia Lubelska (Lublin), vol. 27, No. 148, 3 June 1931, p. 2. ^ a b Hanna Mortkowicz-Olczakowa (see Hanna Mortkowicz-Olczakowa), "Na pięterku" (Up the Little Flight of Stairs), Kamena (Lublin), vol. 27, No. 18 (208), 30 September 1960, pp. 1 & 4. As a first-hand testimonial, this is one of the major primary sources for the biography of Arnsztajnowa. ^ (st. p.) [sic: lower-case initials in parentheses], "Wycinanki" (Newspaper Cuttings), Prosto z mostu (see Prosto z mostu) (Warsaw), vol. 3, No. 34 (142), 25 July 1937, p. 5. The title of the periodical, Prosto z mostu, is a Polish idiomatic expression meaning "without beating about the bush", "straightforwardly", "point-blank". ^ Józef Łobodowski, "W obronie zasługi" (In Defence of Merit), letter to the editor, Wiadomości Literackie (see Wiadomości Literackie) (Warsaw), vol. 14, No. 32 (718), 1 August 1937, p. 8. ^ st. p.) [sic: lower-case initials in parentheses, with the left parenthesis missing], "Wycinanki" (Newspaper Cuttings), Prosto z mostu (see Prosto z mostu) (Warsaw), vol. 3, No. 37 (145), 8 August 1937, p. 8. ^ So, for example, Jarosław Iwaszkiewicz, Marginalia, ed. M. Iwaszkiewicz, et al. , Warsaw, Interim, 1993, p. 11. ISBN 8385083286. ^ So, for example, Julian Krzyżanowski, Neoromantyzm polski: 1890–1918, Wrocław, Zakład Narodowy im. Ossolińskich, 1963, p. 343. Cf. August Grychowski, Lublin i Lubelszczyzna w życiu i twórczości pisarzy polskich: od średniowiecza do 1968 r., Lublin, Wydawnictwo Lubelskie, 1974, p. 266. Rozkwitały pąki białych róż...: wiersze i pieśni z lat 1908–1918 o Polsce, o wojnie i o żołnierzach, ed. A. Romanowski, vol. 1, Warsaw, Czytelnik, 1990, p. 145. ISBN 8307019141. ^ Roman Rosiak, "O Franciszce Arnsztajnowej" (About Franciszka Arnsztajnowa), Kamena (Lublin), vol. 27, No. 4 (194), 29 February 1960, p. 7. The date of 1943 is again repeated in Tadeusz Kłak, "Poetka Ziemi Lubelskiej" (The Poetess of the Lublin Land), Kamena, vol. 32, No. 8 (318), 1–15 May 1965, p. 6. ^ F. Arnsztajnowa, [untitled poem] (lines 1–3); in id., Poezye, Warsaw, Gebethner i Wolff, 1895, p. 85. Arnsztajnowa employs the authorial "I" in the masculine form ("ja byłem", not "ja byłam"). A photograph of Arnsztajnowa in her youth. A photograph of Arnsztajnowa with her siblings: the French philosopher Émile Meyerson, her brother, is in the middle, her sister Henrietta on the right. A photograph of Arnsztajnowa in her mature period. Commemorative plaque on the town house (kamienica) in the ulica Złota No. 2 in Lublin that was owned by Arnsztajnowa. The inscription reads: "IN THIS HOUSE | BETWEEN THE YEARS 1899 and 1934 THERE LIVED | FRANCISZKA ARNSZTAJNOWA | POET | INDEPENDENCE ACTIVIST | CO-FOUNDER IN 1932 | OF THE WRITERS' UNION IN LUBLIN || ON THE 65TH ANNIVERSARY OF THE WRITERS' UNION". This page was last edited on 20 February 2019, at 15:20 (UTC).